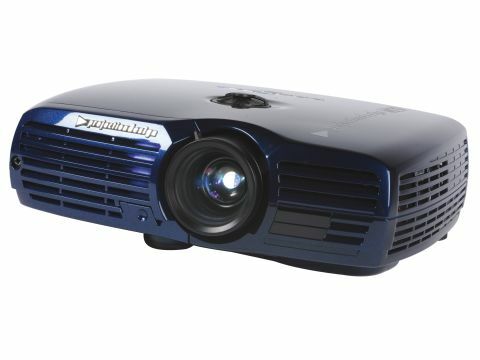 We're so spoiled these days that we expect a projector costing £3,500 to feature a 1080p resolution and a contrast ratio in the tens of thousands, rather than the 1280 x 720 native pixels and 4000:1 claimed by the ProjectionDesign Action! M20. These two apparent specification shortcomings turning out to be insignificant, as the M20 has a technological ace up its sleeve. BrilliantColor has actually appeared on one or two previous projectors in a firmware processing incarnation. But the M20 is the first - and for now only - DLP projector to add a hardware dimension in the shape of a new colour wheel designed with Texas Instruments that spins at a x7 speed and adds cyan, yellow and magenta segments to the traditional red, green and blue ones. This, it's claimed, reduces DLP's common colour noise and rainbow effect problems, produces brighter peak colours and enhances colour toning, with a claimed 200 trillion shades apparently now possible. Given how cutting edge this sounds, though, it's impossible not to feel slightly upset that there's only a single digital video input. But at least other connections are reasonable and the DVI can handle 1080p. The only other important point we should mention is that the projector's 4,000:1 contrast ratio is 'true', in that it's not achieved like high contrast readings with many rival technologies by reducing the lamp's output (and the image's brightness) when a dark scene is detected. While watching an HD recording of Wallace And Gromit: The Curse of the Were-Rabbit from Sky, we were particularly attentive to the M20's colours. And the rich hues of the assorted veg and fairground attractions at the Tottington Hall fête really are a joy to behold, with a combination of superlative richness and exceptional toning that highlights the quality of the 3D sculpting to a degree we haven't previously seen on a projector around £3,500. Although they are its strongest suit, the M20 isn't just about cracking colours. Dark scenes also exhibit extreme dynamic range, thanks to deep and detailed black levels and peak whites that are arguably uniquely pure for this price point. The M20 also reproduces detailing with exceptional clarity - so much so that at times you can see fingerprints in our test movie models - and thanks to the new colour wheel suffers scarcely at all with DLP's rainbow effect and dotting noise over moving skin tones. Moving objects like the Anti-Pesto van during the Were-rabbit pursuit can look a touch indistinct at times. But you'll probably be so busy being wowed by everything else the M20 offers, particularly those groundbreaking colours, that you won't even notice.